Q.How do you succeed in studying? Exam Tips in English Due to mental pressure, you commit suicide. This is a very serious topic because we are in first place in case of student suicide..
Well, in today's competition age, studying and having good numbers is no less than any battle. The point is very simple that if you want to win this fight, then there is a need to make strategies and prepare them accordingly. Generally, due to lack of proper guidance, the students can not prepare properly and the time for the exam is coming closer, anxiety and anxiety increases. Here are some formulas for preparing for any exam and succeeding. Friends, if you really want to be successful, then you have to sacrifice the habit of avoiding tasks. Whatever work is necessary, do it at the right time. "You can do so today, do today today, now it will be settled in the moment, when will you do Bahurai". Which means that we should do tomorrow's work today and today's work now. But today's youth have given birth to a new couplet. They say, "Do it today, do the same time, why do you do it tomorrow, why do so soon, it is still years." We all know what the truth is on friends. That is why we should not discard the work, but do all the necessary work on time. It is very important to choose a suitable and quiet place to study. The place of study should be such that where full concentration and quiet mind can be read and read. If the house is small or there is no such suitable place in the house, it would be better to go to a quiet place outside the house, to go to a friend's house or any library. 3. Create a time table for studies. Any student who wants to succeed, it is necessary for him to create a Time Table of the time set for studies. Assign a certain time for each subject in that time table. Only after making a correct timetable, you will be able to give proper attention to every subject. Friends, it is not enough just to make time tables, it is also important to follow it. 4.Time for sports and entertainment. For a comprehensive development of a student, it is important that he should have time to play sports along with his entertainment as well. Physical development takes place by playing sports. You can also enjoy the Memory Improvement Games inside the house. When we start doing any big work, it seems very difficult and impossible at the beginning. But when we divide it into small pieces, then the same thing becomes easier. Similarly, in the study, a large chapter or formula can be made easier by dividing it into smaller parts. It becomes easy to read and interesting. 6. Know your energy level. At different times of the day, the level of physical and mental stress of each person can be different, then some people in the evening or at night. Some people get up in the morning and remember to read more, then some have been taught late night. So when you feel more and more confident about yourself, keep that time for your studies. Your brain gets tired while studying. Whenever you feel tired, take a short break. Usually, after 30 to 40 minutes, you should rest a bit while studying. Whenever you sit to study, always have a Highlighter Pen with you. If you see any important name, date, location or sentence, then highlight it immediately. This way you will get a lot of help while doing revision. Set goals for your studies in life. Which chapter or book you want to finish in, how many subjects need special attention or what percentage points will be required to go to the favorite college. So it is very important to decide the goals of your studies. If you study every week, setting the goal of the month, then at the end of the year you will be able to prepare for the exam without proper nervousness. Use as many of your five senses (ears, nose, eyes, tongue and skin) in your studies. Observe the pictures and charts printed in the book. If possible, make a practical in the lab or touch the model related to the subject. Now the CD comes with books. These CDs also help in understanding the subject. 11. Use the Brainstorming Techniques. If you know about Memory Improvement Techniques or you have learned them from somewhere, then use them in your studies. These techniques are very scientific and the results are oriented. An old saying is, "Just like food, that kind of mind", which means that one becomes like a person's food, his mind and body become. It is very important that you take balanced meals. Avoid junk food like cold drinks and pizza and burgers. The right way to eat is that you eat breakfast in the morning, light lunch and light meals from the night. If possible, take only salad and liquids in the dinner. 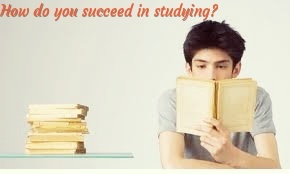 How do you succeed in studying?